Faye and I were on the edge of last weeks’ awful cold. We were spared the worst of last weeks’ cold. The lowest the thermometer dropped to was -24C, (-10F). 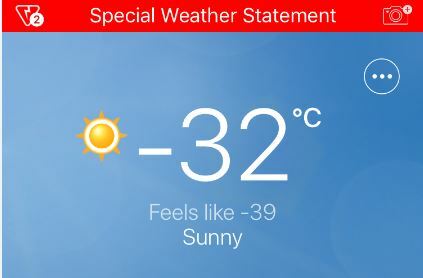 Thursday’s high was -16C (3F). At work, we mostly stayed in. Our Production Supervisor had to leave the admin building to monitor the boiler and ensure two buildings had enough heat so their fore protection systems didn’t freeze. I went out a few times to check items I maintain inventory records of as well as to live the cold. We’re provided with fire resistant coveralls as well as a very robust FR jacket which I bundled up into. Nonetheless I got very cold. At home, never got a chance to use my brand new roof rake, the wind blew the roof clean. It snowed about 10cm (4 inches) before the bitter cold hit so I spent some time shovelling out the end of the driveway. Faye worked afternoons last week, driving the truck each day. It wouldn’t start Wednesday night and we wound up buying a battery Thursday. Wouldn’t start Friday. But has been fine since. The clutch was very stiff and I suspect we couldn’t push it out past the kill switch. It was not easy on the dogs . . . Achilles and Fitzi that is. Senior Chili needed to be supervised as he would pee and poop then stop and look for help navigating off the arctic ground. Fitzi had little desire to spend any more time outside than it took to pee and pr poop. Once he found a large stick to pick up and prance around with . . . except it was frozen solid to the ground. During every outing, pretty soon it was time to go in so he could get in front of the wall furnace. Now, Miss Tomboy Lucy was a rough tough girl, wanting to mess with the squirrels and play Chuck-it! . . . for a while. How did you get through the cold? We had nearly identical weather. Put the goats and chickens in the basement near the drain pipe. We've kept track of this method in the past and know that they raise the temperature significantly in that area so that worked well. Louise (our goat) just about dragged me inside and ran straight into her crate. She always knows when the weather is coming in. Then we all holed up. Zo slipped at some point and strained something in her leg. Three days of recovery but she's back on track. We saw something taped to our front door the second day. It was the inventory of our livestock which is required annually by our animal control officer. The idea is that she checks the animals and their accommodations then files a slip with the federal government so they can keep track of disease and potential problems. I seriously doubt she went into our basement so she never did see them. It was weird that she was doing that during extreme cold so hopefully she wasn't in our area because somebody's pets were in distress. It was a long, cold haul. Wind chills got to -50 a couple of nights. Plenty of snow that Bill had to do in sections as it was too cold to stay out for any length of time. Surprisingly, Katie did fine. She did not stay out long but I think the snow helped insulate her paws. Sure don't want to go through that again. This wasn't the coldest that we hit but pretty close. You know it's cold when you step outside and your nose freezes immediately. A couple of times we went out for our 9:00 pm walk up the block and had to turn around almost immediately. Pretty much the same here but today we hit +9C (~49F). It's terrible. We've had a sad winter with little snow but the banks we have are high enough to prevent water from draining off the roads and I saw signs today warning of water over roads. Our snowmobile trails didn't open till about two weeks ago and now they are bare in places. janedoe, one of my co-workers has chickens and goats. Of course the chickens never left the coop and the goats never left the barn. I understand that paths of hay or some such are laid out when it’s messy because the goats hate to get wet and muddy. Fran, it was a cold and awful haul, I think y’all got it worse than we did. I know some retired people up in Madison WI and they said they never left home because it was too cold and too dangerous. Woody yup that was cold. Our truck might have died. Brakes are gone and I hope the cylinder head or block didn’t crack. Snowshoe, we had a sorry excuse for winter until a couple weeks ago. Perhaps this is the new normal. The snowmobilers had been immobilized until then which did not hurt my feelings. It would be fair to say that I am not a fan of recreational snowmobiling. We were 6F last Saturday morning, windchill well below zero. Miserable. Of course it was 69 here yesterday, I was running around in a t-shirt at field training. Crazy. We don't have enough animals for sufficient shared body heat or a barn. We almost lost the goats one year in -10F. The system works for us. Some of our other neighbors take theirs to a barn nearby. We just use the basement. Janedoe, I was thinking of you and your menagerie during that cold spell. I saw a photo of someone's chickens in a camping tent inside their home. Kept them corralled and I guess tents usually have a waterproof bottom. I thought yours would probably be in the basement. Like Barry, we had 5 degree F weather, not counting the wind chill, and then this week, temps in the upper 60s. Lark and Henry seemed happy to be outside no matter the temperature. Our backyard now has standing water that freezes overnight if the temp gets low enough then thaws into a swampy mess during the day. All the better to race around in and dig holes, according to my 2. My kitchen floor has never been so dirty and so clean in such rapid sequence.